Keep your child's room clutter-free with the Sort 'N Store Toy Chest. Your child's toys can now go back to where they belong after playtime. This Primary Colors Toy Chest comes with an extra-large capacity of 6 cu ft to fit all of your child's toys without any trouble. The extra-large storage space makes it ideal even for big toys. 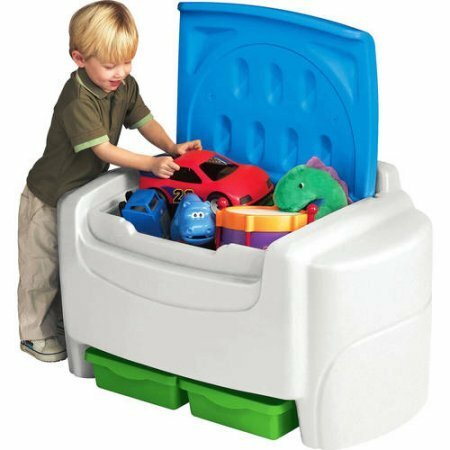 This kids' toy storage also comes with two removable pull-out bins for storing smaller toys, so you can separate items by size and protect the smaller ones. Toy chests are made of high-quality durable plastic. They are also lightweight to make moving them from room to room much easier. This toy chest also comes with a detachable lid for your child's safety and to make it easier for children to remove their toys from the box. Bright red color adds attraction and blends in with your kid's room. This storage chest is recommended for children ages 2 and older. Helps keep child's room clutter-free and organized. Recommended for children ages 2 years and older.